In this video Native Instruments product specialist Matt Cellitti, explains and demonstrates how to use Maschine to control Ableton Live and simultaneously as a plugin inside the software. Together Maschine and Ableton are a powerful combination for production and performance. Cellitti starts by showing us how to load the Ableton Live template that can be accessed via Maschine’s hardware or Native Instruments bundled Controller Editor software. He then goes into detail of how Maschine can be used to trigger clips, scenes and FX as well as control other parameters such as individual track volume. After this, he explains how to switch Maschine to a standard MIDI controller within Ableton to program and perform new drum parts and synth lines, all without stopping the music in Ableton Live. For more start dates and information about payment plans, please call 212.242.2100 or 1.877.DUBSPOT (1.877.382.7768) or send us a message. The flagship of our music training, with every Ableton Live course offered at the school. After completing this program, you will leave with 4 completed tracks (EP), a remix entered in an active contest, a scored commercial to widen your scope, and the Dubspot Producer’s Certificate in Ableton Live. This program is about learning Ableton Live by going through the entire process of being an artist, from developing your sound through a series of sketches while getting familiar with the application to creating a fully-fleshed out four song EP. You will create a remix and submit it to an active remix contest, score a commercial, and learn valuable insider tips and techniques. After completing this program, you will leave with a multi-track EP, a remix entered in an active remix contest, a scored commercial to widen your scope, and the Dubspot Producer’s Certificate in Ableton Live. Just when we thought that hardware was out and everything could be done on a laptop, Native Instruments brings us the best of both worlds with Maschine. This production/performance tool allows us to bang out sound patterns on intelligent physical pads while far exceeding the display and processing limitations of conventional hardware. The whole is greater than the sum of its parts as Maschine gives us a truly symbiotic relationship between hardware and software. This series of workshops will examine both halves and work out the strengths of each. Students will build kits using the library, explore optimal techniques for drum recording, sequence effects with hands-on automation, and edit and slice loops for instant playback on pads, all while streamlining your workflow. Stay tuned for info on our upcoming 3-level program with NI’s Maschine, which merges performance and production. 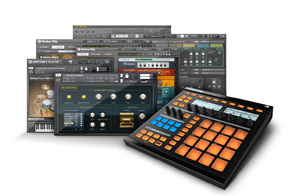 Native Instruments’s Maschine redefines the intersection of hardware and software, performance and production. It allows you to not only bring your tools to the stage but is actually a tool you want in the studio to begin with. With Dubspot’s upcoming Maschine for Performers and Producers program, you will go from shaking hands with this cutting-edge device to making full tracks and live improvisations within three courses. The future of performance and production is here, and there is no time for the future like today.